Cook pasta according to package directions, omitting any salt or fat. Drain and keep warm. Heat oil in large nonstick skillet over medium-high heat. Add garlic, broccoli, zucchini and bell pepper. Cook and stir about 2 minutes or until vegetables just begin to soften. Add tomatoes, mushrooms, and oregano; mix well. Reduce heat to medium and cook and stir about 8 minutes or until vegetables are tender and tomatoes release their juices. 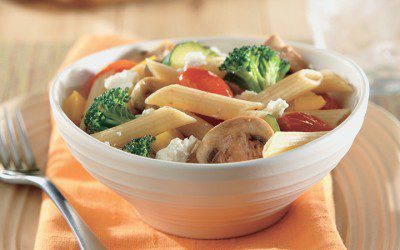 Mix vegetables with pasta. Toss in feta cheese. Exchanges per serving: 2 Bread/Starch, 1/2 Fat, 2 Vegetable, 1 Meat.